« Surface Pro 3 SIMPLO Battery Issue? 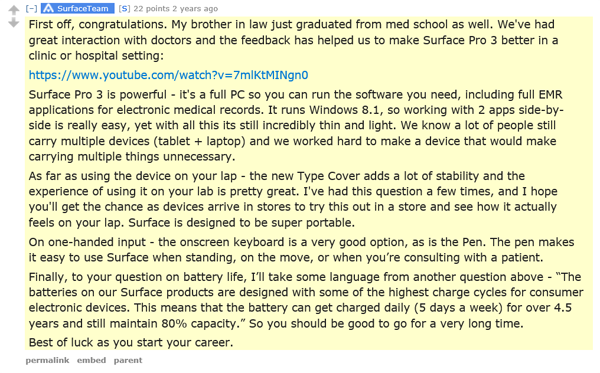 Microsoft told customers in the same Reddit AMA https://www.reddit.com/r/IAmA/comments/26m9cu/we_are_panos_panay_and_the_surface_team_at/chse7pn that “the battery can get charged daily (5 days a week) for over 4.5 years and still maintain 80% capacity”. Again, customers are responding in the thread that they can’t even use their devices while connected or docked. I checked my sent email and note that as a Community Forum Moderator that I brought it to the attention of Microsoft on March 3, 2016. And a couple of times thereafter. I saw the trending that early. And as of Saturday, March 6, afflicted Microsoft customers have not had a single update on the situation since the initial “we think we can fix in software and are working on a fix”.